StarBeat presented the Live Finals of the Top Latte Artist in Vancouver contest Friday night at Kafka’s Coffee Shop on the Emily Carr campus. The event was sponsored by ECM, Breville, Canadian Barista Academy, Barista Canada, Storm Brewing, Agro Roasters, and Kafka’s Coffee. 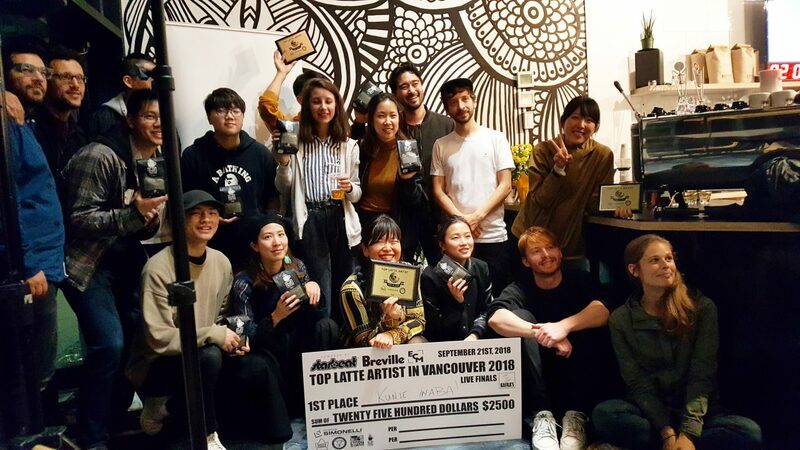 16 competitors battled it out in front of 5 expert judges and a crowd of over 150 people to see who would win the grand prize of $2,500 and earn the prestige title of Top Latte Artist in Vancouver 2018. The Guest Judges included Tristan Mapstone, Laura Perry, Sammy Piccolo, Aaron Kafka, and Cole Torode, all legendary figures in the coffee industry. The competition went from 6:30pm until 8pm with some breaks in the middle for people to recharge their coffees and beers. Awards were presented around 9:30pm and the prizes were given out. Huge Congratulations to Kunie Inaba for taking 1st place in the competition and being officially named ‘Top Latte Artist in Vancouver’. A big Thank You to all the competitors and audience members for coming out and making it an awesome night, and thanks to Kafka’s Coffee for providing the venue. Thank you again to everyone that came out and made this such a great event!